Our white wine: full taste and aromatic richness to be brought to the table. Variety: 80% white Moscato from Canelli, 20% Cortese. Production area: Town of San Marzano Oliveto. Vineyards: Town of San Marzano Oliveto. Pruning system is Guyot. Planted in the years of 1981 and 1990. Working techniques in the vineyards: Pruning leaving 7/8 buds. Activities in the vineyardsare guided by a modern Biodynamic method,vineyards are certified organic by “Solo e Salute”. Light golden and straw-colored yellow, aromatic and intense perfume with characteristic scents of Camomile and honey. The taste is full and rich on fruity scents, with a light dry note, typical and persistent. It is a white wine made with selected white grapes. After being softly pressed, the Moscato grapes and the Cortese grapes the ferments slowly and relaxed on separate containers for as long as it takes to stabilize naturally and to consume all of their sugar. The structure and intensity derived make it a product of longevity and great body. 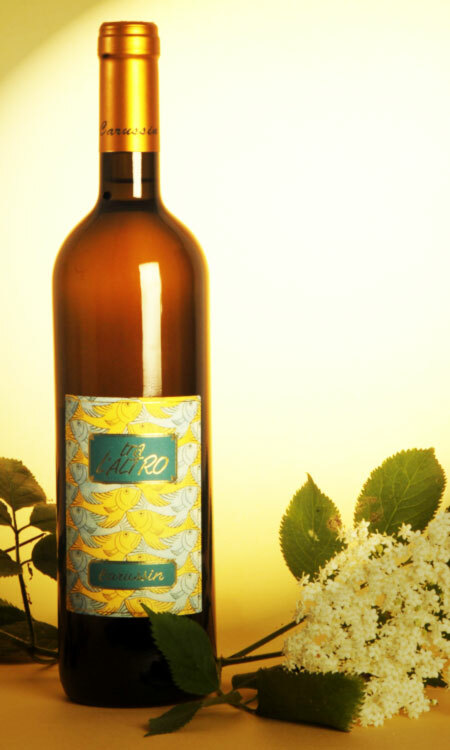 Tra l’Altro is born from Luigi’s passion to white wines. The name “Tra l’Altro” comes from the discussion of the vinification process with a Swiss colleague, who has a line of white wines and just one red wine called “de andere”, which means “the other” in German, Carussin has mainly red wines, so there came the idea of “copying” the name “Tra l’Altro” (“between others”, “in between”, or “meanwhile”). For who falls in love with it, it’s a wine that suits perfectly well with fish dishes, recommended for first dishes, white meat and medium aged cheeses.